Aruba beaches rank high among all Caribbean beaches, for a good reason: white sand, calm, turquoise water - what else can you dream of? Whether you want to dip your toes into Aruba's sand, swim, snorkel or indulge into vigorous sports activities - here are the best beaches for you! If you are looking for a great family day outing, Baby Beach is perfect venue. 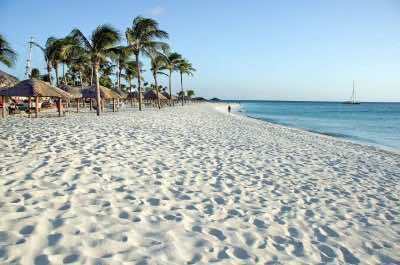 One of the best Aruba beaches, it is located on the south eastern tip of the Island. This man-made lagoon offers clean, soft white flat sands that lead into warm water only 5 feet deep. The environment is safe, sheltered and the water is always calm with no waves, making it ideal for small children and older people. If you are a beginner snorkeler, this is the perfect place to learn! Take a walk, sun bathe, swim and enjoy a relaxing day out. If you prefer to take a tour, you can combine a visit to Baby Beach with a trip to the Natural Bridge and Natural Pool. Prefer a beach where rubbing shoulders with the movers and shakers is the thing? 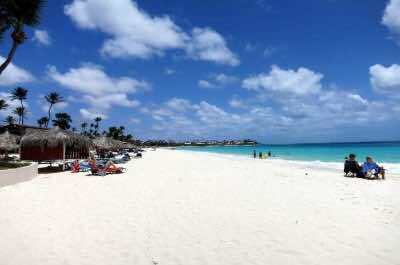 Palm Beach is one of the most famous hip and happening best Aruba beaches. This beach setting is surrounded by luxurious high-rise hotels and 5-star resorts. The sand is clean and white and demands designer swimwear as you relax on a beach lounger. Food and drink stands are found in abundance and operate day and night. 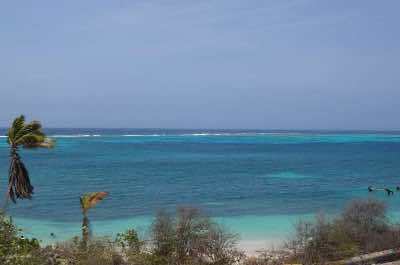 The beach is located north west of Oranjestad, the capital city. Walk along the shady piers, stop for a meal at a trendy restaurant and then do some shopping. After lunch take a boat ride and enjoy some snorkeling, there are many water sport operators who will advise. When you are done, settle down with a cocktail and watch the beautiful people! 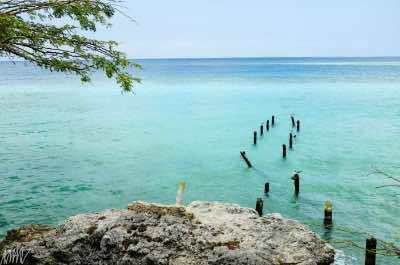 Historians will be enchanted by the fabulous Aruba beach known as Arashi Beach. Located at the northern most tip of the Island, this secluded setting offers a perfect relaxing day out. The warm waters are azure blue and calm, soft white sands make for a great walk or sun bathing and the surrounding views are stunning. This beach is the final resting place of the Antilla, a World War II German freighter. The wreck lies close to the shore and can sometimes be seen from the beach. If you want a more in-depth look, serious divers can do some scuba diving with a guide. Snorkelers will be thrilled to see the famous elkhorn coral which makes up a large part of the reefs around this beach. For some sightseeing near by, head off to the California Lighthouse. 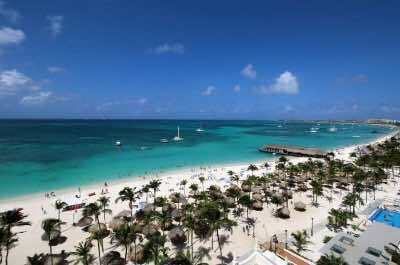 Boca Catalina Beach is another stunning Aruba beach that offers fabulous snorkeling. It is located in the north of the Island and features a picture-postcard scene of white sands with rocky outcrops that are fun to explore looking for shells and treasures. The calm blue waters will thrill snorkelers with their myriad of colorful fish, unique black coral reefs, starfish, sea urchins and turtles that inhabit these reefs. Swim, sun bathe and walk, when you are done, there is free access to beach umbrellas, so you can set yourself up and relax. If you prefer some guidance, there are many tours to be had, including some that accommodate snorkelers who are beginners! Photo by Sean's fotos on Flickr. 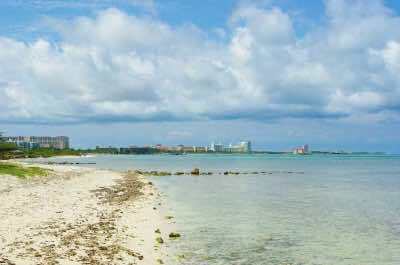 Another great Aruba beach that is located close to the capital city, Oranjestad, is Eagle Beach. Rated as one of the top beaches in the world, it is known for its pristine white sand, clear aqua blue waters and swaying palm trees. The beach is surrounded by resorts and offers a host of entertainment enjoyed by both tourists and locals. If you are staying at one of the resorts you will have access to the beach with loungers and umbrellas, if not, they are easily obtainable when you arrive. Extreme sports lovers can try their hand at jet skiing, parasailing or stand up paddles, while the rest can relax and soak up the sun and the peaceful atmosphere. Located close enough to the city, but far enough for total relaxation, Druif Beach is the next Aruba beach to visit. Near to Oranjestad, on the west coast, it features a long narrow oval-shaped stretch of clean white sand and azure blue waters with small waves. The occasional low-lying resort dots the inland view. Rent a chair and relax or take a walk along the boardwalk, it is also suitable for wheelchairs. Accommodation and restaurants are nearby and the beach is less crowded than some of the other hot spots. Set up for a romantic evening watching the sun set while you sip an exotic pi–a colada with a special person! 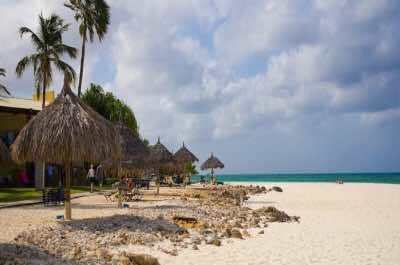 Manchebo Beach is closely linked to the luxurious resort and spa and is a fabulous Aruba beach to visit. Clean white sands stretch for miles, the water is azure blue and calm, perfect for families with small children. Dominating the beach is the luxurious hotel which offers world class restaurants, bars and a spa treatment facility. How about a massage on the beach? If you are not staying at the hotel, rent some chairs and umbrellas and settle down for a relaxing day. The scenery is stunning and the beach is less touristy than some of the others in the area. Snorkelers will enjoy the array of colorful marine life that live in the waters and this beach makes the perfect romantic spot to watch the sun set! Photo by Stefan Krasowski on Flickr. 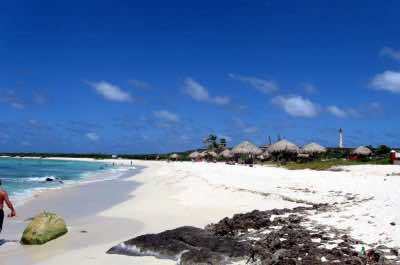 Malmok beach on the west coast is a popular Aruba beach, known for its fabulous snorkeling. The narrow sandy shore is interspersed with rocky outcrops, offering a myriad of marine species that will delight. See beautiful corals, sea turtles, sea urchins and maybe a stingray! Swimming in the clear aqua blue waters is ideal for the whole family. Luxurious catamaran and sailboat tours stop here for snorkeling and the waters can get busy at times. The sands run alongside the famous Malmok Beach Road which is a favorite for locals and tourists who enjoy hiking or biking. After soaking up the sun, head off to the California Lighthouse or play a round of golf at the Tierra del Sol 18-hole golf course. 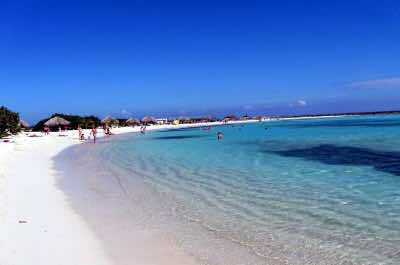 Mangel Halto Beach in Aruba is located on the south east coast, in the Pos Chiquito region. This Aruba beach is world famous for its fabulous snorkeling and unique mangrove vegetation. The clear waters are very shallow close to the shore, making it ideal for small children. You can walk out along the reefs and see parrotfish, beautiful corals and sponges. As you get further out, the reefs plunge downwards and scuba divers and snorkelers will find a paradise of exotic marine life waiting to be explored. See octopus, barracuda, morays and amazing coral formations. Kayak through the mangroves with a guide, join a yoga class on the beach or simply relax and soak up the stunning views. The next Aruba beach to visit is Rodger's Beach, located in the San Nicolas region in the far south. This paradisical setting offers clean, soft powdery white sands, azure blue waters and rocky outcrops, ideal for shell collectors. Fisherman anchor their boats here in this calm and protected area, creating a picture-perfect scene that must be captured on camera! Relax on the beach, walk or swim. If you want to snorkel, a local dive shop has equipment to rent and the small restaurant will be the perfect place for a snack when you are done. Locals love this beach and they always know the best spots!